Launched in 1983, Blueprint was the first magazine to cross the boundaries between design and architecture. It was established by Peter Murray and Deyan Sudjic with the financial backing of leading architects and designers including Norman Foster and Rodney Fitch. Today, it continues to be revered by architects and designers around the world for its fresh and unconventional approach. Past editors have included Rowan Moore (former director of the Architecture Foundation) and Marcus Field (former arts editor of The Independent on Sunday), and art directors have included the respected designers Simon Esterson, Andrew Johnson and John Belknap. 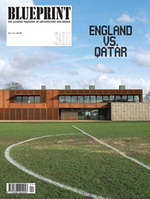 In September 2006, the magazine was relaunched to critical acclaim, with a new format. Blueprint’s art director, Patrick Myles, worked with internationally renowned typographer David Quay to develop a new typeface specially for the magazine, Blueprint New Era. Patrick was named Designer of the Year at the PPA Awardsfor his efforts. Blueprint has gone from strength to strength since, repeatedly breaking records for the best-selling and biggest issues in the magazine’s history.